I can definitely say that I loved the knit, even if the tiny cables on the sleeves drove me a bit crazy. (But I’m already forgetting the difficulty of the cables – see, it was a great idea to tackle the sleeves first after splitting at the armhole! Plenty of time to recover while working on the body. 😛 ) I like that even with my modifications to the original bottom-up instructions to make the project top-down, it doesn’t look too weird. Another minor issue is that I used 2.75mm needles for this, and though I thought the stitches looked fine on my swatch, they don’t appear too tight now on the blouse. But maybe it’s just me, because my mom didn’t seem too bothered. As for this month, I haven’t started on another knitting project yet since I wanted to concentrate on the Linen and Threads Mystery SAL’s final section for the year. However, there’s not been much progress on the cross-stitching either, because design alterations! (Did you guess that? 😉 ) This month’s section circles back to the January one, with a human surrounded by flora and fauna. There was too much empty space at the bottom of the current section due to the long dress that the person wore, and I ended up cutting the dress so I could trim down the space at the bottom to match the top of the project. And since I’d already hem-stitched the bottom border when I’d started the project, I undid and redid it along the new border. That’s me so far this month. How are your projects coming along? These tassels don’t really take a long time to make, but I ended up spreading my work over a few evenings as usual. 🙂 I made two-tiered tassels, the second tier created by using a half each from two adjacent tassels in the first tier. While I was chugging along on one sari, my mom finished her single tier tassels on two saris! Aren’t the saris just gorgeous? 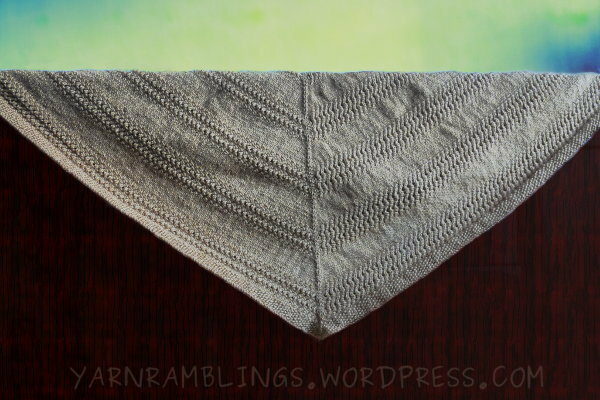 I knit this shawl inspired by the notes jotted down in the Textured Shawl pattern by Orlane Designs. I think this was the first shawl that I ever knit (but it remained on the needles for a long while.) The notes vary the number of pattern rows, whereas I kept it constant, and I introduced two plain stockinette rows after every two pattern rows. Also, my shawl has a seed stitch border. 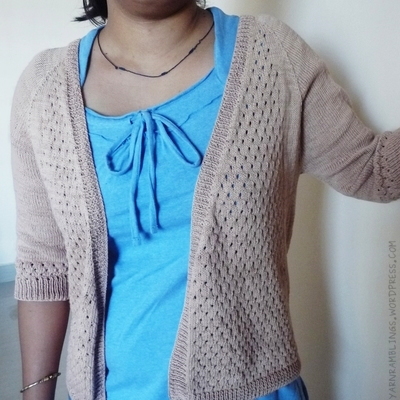 Eyelet-patterned raglan cardigan – finished! While I was knitting the ribbing, I got to thinking more about the cast-off (bind-off.) For this cardigan, I simply cast off in pattern, i.e. continue with the 1×1 rib pattern while slipping the previous stitch off the right needle. It’s easy that way for top-down sweaters because all borders are knit towards the outside from the middle of the fabric. Whether it is the body and the sleeves — where one just switches to the ribbing after the last main row, or at the neck and the front — where one picks up stitches and makes the ribbing, the bind-off is the last row for all parts of top-down sweaters. Not so for bottom up ones knit in parts — there, the body and sleeves have borders whose bottommost rows are the cast-on rows, but for the neck and front, the bottommost row is the bind-off row. And that means that the cast-on stitch needs to match the bind-off stitch. So it’s research time, since I’m going to make my next cardigan in a bottom-up fashion. The next step that I want to take is to write pattern instructions. Not for this cardigan — it has some increases that are non-uniform and need careful counting, and since patterns need to be written for various sizes, it’s more than I can handle. Next time I think of a relatively easier pattern, I’ll give instructions-writing a go!